What’s the Deal with Ductless Cooling? For many years, cooling a home required either an extensive central air conditioning system or noisy, rattling window units. Central air was great if you wanted to maintain the same temperature through your entire home (or at least several rooms). But it gets expensive to cool empty rooms all day. Window air conditioners could chill one room at a time, but were heavy, dripped condensation and used lots of electricity. Plus, they blocked off a window. Now Alvin Hollis can offer you the option of a compact, quiet and efficient “ductless mini-split” system that not only cools a room, but also provides heat when outside temperatures drop. Ductless cooling systems are the “hottest” thing in the residential air conditioning market. They are great for cooling an addition, or if you have just one or two rooms that you use most often. We have been installing ductless units as whole-house air conditioning systems, and also for homeowners who want to cool just one floor or even one room. No expensive and troublesome ductwork necessary! Each room can be set to the desired temperature and easily changed using the remote control provided. The Mitsubishi Electric ductless systems we install are among the most efficient units in the industry. 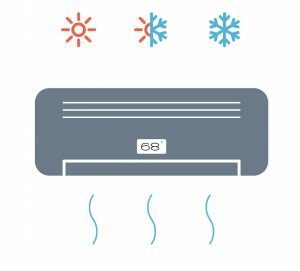 They are virtually silent because the operating unit (condenser) is mounted outside the house, can be adjusted individually, and can even be turned on via your smart phone to cool down the house before you arrive home from work or the beach. Depending its size and number of units included, a ductless cooling system can be installed in as little as a single day. So you can start to enjoy cool comfort quickly. The best news? You gain the added benefit of switching to efficient heating mode during the winter months. This can help reduce heating oil consumption, as you can choose to heat only the rooms your family uses most often. Want to learn more about the most advanced ductless cooling systems on the market? Call Alvin Hollis at (800) 649-5090 to explore which of our air conditioning options is right for your home and budget.